So in case you missed it, last week I got home from a road trip involving heading down to San Jose for PantheaCon, then heading back up the Pacific coast by way of highways 1 and 101. My partner and I ended up doing some inexpensive (read: free) touristy things. We also spent a good deal of time poking around antique shops and flea markets for inexpensive art supplies and other goodies. I didn’t have a huge budget, but I did find a few really nice things, particularly in the realm of beads. So last night I made some time to just sit and make jewelry, since I’ve been itching to play with the new beads I got since we got home. The first necklace I made was one that I had been planning in my head as I was collecting beads and findings from here and there, and as it came together its spirit wrapped around me, cuddled up close, and refused to let go. Each bead I put on the wire told a bit more of the story of our trip, and when I was done, I had the perfect souvenir of our adventures together. See, we started down in San Jose itself, once the convention was over. And when we escaped the urban areas and got into the wilderness, we were greeted by the beauty of redwoods, one of several new experiences for me. The same day I left PantheaCon as it closed was the first day I got to see redwood groves in Muir Woods. Later in the week we drove down the Avenue of the Gods, further north along the coastline once we had reached 1/101. And it was there that we stopped at a little independently-owned gift shop. Most of what they had were either out of my price range ($80 bowls made from redwood burls, totally worth the price for their craft) or not particularly useful to me (yet ANOTHER sweatshirt?) But I found a string of polished beads made from redwood scrap, and three little clusters of redwood needles coated in 24K gold, sitting forlornly on the clearance rack. So those carried the energy of new experiences–the redwoods, the California coastline, my first coastal storm, and the seemingly endless road trip. Later that day, we traveled along to Ferndale, a small town a little outside of Eureka. My partner wanted to check out all the restored Victorian homes and business buildings, and was not disappointed. There were gingerbread manses galore, and the downtown district was full to overbrimming with historic locations and 19th century construction that had survived storms and fires and neglect. We visited an artist who had made the town his home for many decades, who opened a studio not to sell his art, but to share it for free, and to teach people his crafts. We took pictures of lovingly cared-for houses and churches. And we explored a little general store of nouveau-vintage items, knickknacks, and an extensive display of period antiques for all to see. At this place I found several strands of glass beads, as well as some dyed freshwater pearls. A few of these pearls, dyed green-gold, flank the redwood beads. The pearls represent the best of human contributions–creativity, conservation, and art–which were evident not only in Ferndale, but in various communities throughout our trip. Across the Oregon border, not too far from home, we ended up in Waldport, one of a string of little coastal towns. While my partner chatted up the owner of a local knife and sword shop, I wandered over to a flea market across the street. I poked through various antiques and tchotchkes, and came across a veritable treasure trove of little wood beads of the sort that I use frequently in my jewelry. The seller wanted naught but a song for them, and I knew they’d get used, so they went home with me as well. And as I stepped back out onto the street with my little purchase, looked at the little rows of shops that characterize so many Oregon coast towns along 101, and breathed the salt-tinged air, I knew I was back home. 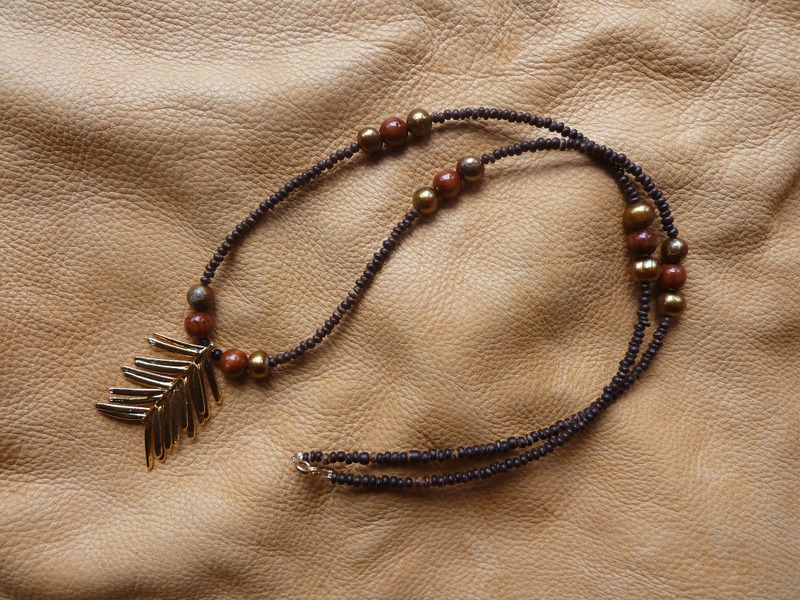 And these little brown beads–those ground the necklace. They’re not the most flashy ones, but they connect the islands of shiny redwood and pearl together. And in the same way, home is what makes the moments of exploration and adventure stand out even more. It’s not that home is a bad thing; quite the contrary. My partner and I have created a cozy living situation together, and Portland is a good place to be right now. Home is a safe place to return to when the adventures are through for the time being. And the adventures are all the better when I know I have that anchor if I need it, if I start feeling overwhelmed by all the new things, or tired from driving. The shine and sparkle of new places helps me appreciate home more, and without my good home I couldn’t enjoy travel nearly so often on the occasions it happens. The necklace I’ve created, then, isn’t just some shiny thing–indeed, I very rarely wear jewelry other than my usual wolf chain. So for me to keep something like this that I would normally release into the wild, as it were, is an occasion to be noted. Right now, as I am easing back into the routines and challenges of everyday life, I am wearing this necklace to remind me of those beautiful adventures and the healing they gave me. I carry with me the redwoods, and the gingerbread, and the crashing waves on bluffs. And I smile, and continue on with my day here at home.